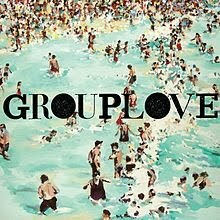 There's no shortage of West Coast American bands at the moment who are lazily strumming but none of them are as good as Grouplove are at their best. You'll have already heard 'Colours', the lead track from the Los Angeles based five-piece's debut mini-album and will therefore be familiar with the fact that they take this slacker sun-kissed template and imbue it with an an edge that hints at so much more than we're used to from the kids of American privilege. Instead of recalling the laid-back vibes of a singer-songwriter, the acoustic guitars are played like post-punk instruments of acression. The drum rolls pas between ears and there's sense of hippie euphoria that runs completely contradictory to the sonic assault. It's moments like this that hint at the talent and potential in the group that might otherwise be lost in the summery feel. 'Naked Kids' opens with the line “Cruising on the highway with my friends, top down / And we're all on our way to the beach”, and even though you don't doubt that there's some genuine sentimentality or nostalgia behind the reminiscing you get the impression that there's an element of sarcasm. It's as though they know the conventions of this bleached Americana so well that subverting them comes easy for them. Still that doesn't change the fact that the harmonies are gorgeous and the paced guitar make us all pine for the sun and sand. With measured drums and spacious production, 'Gold Coast' recalls the sadly dormant Shins. The male-female vocal harmonies of Christopher Zucconi and Hannah Hooper ensure that, despite a less obvious chorus, the track retains a vocal hook and promises to be one to be chanted back at the band as they do the rounds over the summer festivals. The fade out helps to disguise what would otherwise be a somewhat jarring move from 'Gold Coast' to following track 'Getaway Car'. Where the former maintained a sense of space, the latter has a drawled vocal and drum machines at the fore. It's much more lo-fi than the previous Grouplove moments but still reaches for the sky. Again, even if it doesn't work quite as well as the best tracks it retains the groups's edge in a cluttered scene. Like 'Colours', 'Don't Say Oh Well' is one of the Big tracks from the record. Almost like Fleetwood Mac going punk, it's giddy melodic and full of energy. An album full of tracks like these two smashes could well be one of the great records of the year, even if it would lack in variety. Try sticking on 'Don't Say Oh Well' and not wanting to bounce around the room whilst grinning like a berk, I bet you can't do it. Grouplove closes with the campfire chant of 'Get Giddy', and it's this very of the moment feel that makes us not only want more but feel confident that they've more to give. There's plenty of ideas across these 20 minutes and the band are very likely to create an excellent debut album proper this year. If they land it on a summer that's anything like the spring we're currently having in the UK then they're certain to get a leg up and the chance to be pretty highly regarded.